Her inspiration explores how female artists from the Redland Art Gallery Collection interpret the places they work and inhabit within the Redlands and Moreton Bay area. Artists include Melva Moore, Sheelah Mee, Lisa Iselin, Kathryn Blumke, Kay Faulkner, Carolyn Dodds and Fiona Foley. The exhibition will also feature historical women’s objects on loan from the Redland Museum. These items were owned by significant Redlands women whose families helped established the region. 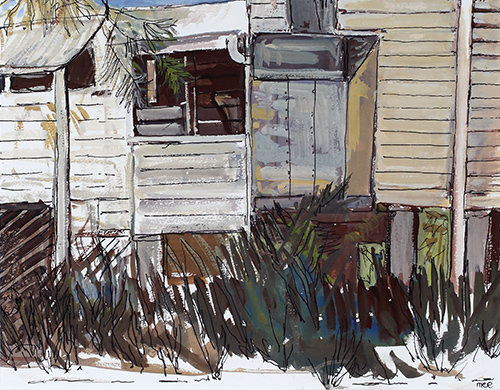 Images: Sheelah Mee, Queenslander (detail) 1991, gouache and pen on paper. Redland Art Gallery Collection. Acquired by Redland City Council prior to 2003.